Fish gather around underwater structure, such as Christmas trees in Lake Allatoona. Find structure and your chance for a strike will improve. Ask any fisherperson what the secret is to catching fish and you’ll never get the right answer. Think about it. If they really knew how to catch fish when nobody else can catch fish, why would they tell us? But!!! When you locate places where fish hide … well … you’ve found places where fish hide. So, that’s something. Right? 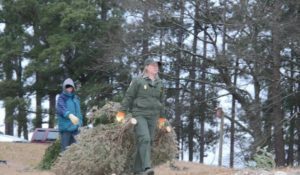 After the last ho, ho, ho and the cat became bored with destroying every precious ornament, US Army Corps of Engineers rangers and volunteers gathered to sink donated Christmas trees in Lake Allatoona to attract fish. No, that doesn’t mean you’ll be able to catch more fish. Sorry. It does, however, mean that you’ll be able to identify varieties of fish on expensive electronic fish-finders that color-code and record the movements of large and small bass, etc. On Saturday, January 12, 2019, more than 150 recycled Christmas trees were added to anchor points near the Blockhouse fishing jetty. The trees, dropped off by the public, were delivered to the site during the week by USACE Rangers and volunteer staff. Volunteers then stacked the trees and drilled holes in the bases of the trees. During the Saturday event, the trees were wired down onto pre-constructed anchor points in the lake bed to give new homes to elusive fish that laugh at our most expensive lures and that bite worms dangled by our unskilled children. Because that’s how fishing works. Thank you to GA DNR Fisheries Division, Keep Bartow Beautiful, Marietta Bassmasters and Corps Volunteers.